We recently received a card, pictured here, from a local vendor of services that asked us to leave an online review for their service. There are many things we like about the request. They caught us at a great time. It was at the end of the provision of services, and we were very happy with the services they provided. Strike when the iron is hot! That’s a great time to ask someone to write a review. We also like that the appeal was made in person. This is a great way to blend your real world marketing efforts with what you do online. Kudos! We also like that they directed us to the important places on the web to leave online reviews. Google is critical. Yelp, although it has its share of problems, is another great place to obtain online reviews. Angie’s List seeks to be an objective source for reviews about local vendors. The company’s own Facebook page-another great location. However, there are some substantial problems with this request also. The big one of course is that for all intents and purposes it looks like the organization is trying to buy positive reviews. 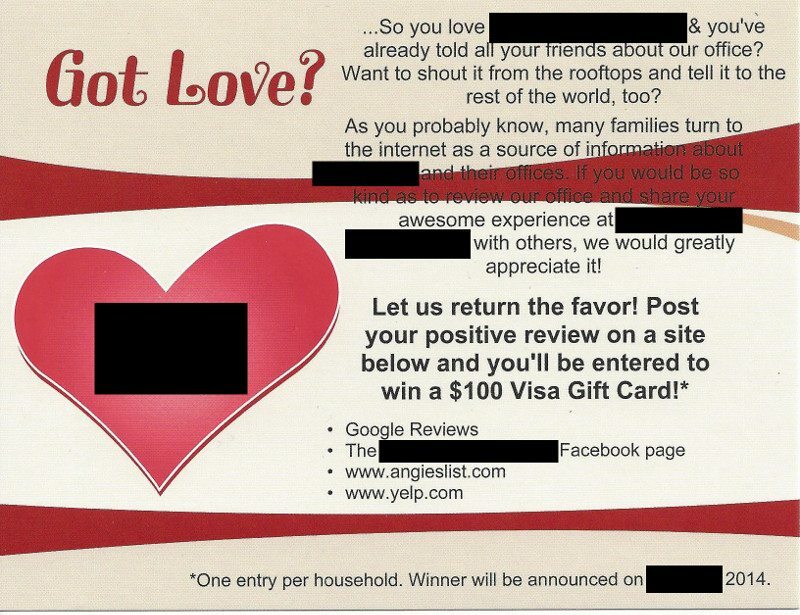 The card indicates that if you leave a “positive” review, you can be entered into a raffle to win a $100 gift card. The organization could potentially have tempered the pitch by indicating that a person who enters any review, whether positive or negative, could be entered in the raffle. That would still probably be problematic however. Websites that collect online reviews generally, as part of their terms of service, frown on offering rewards to individuals who submit reviews. (And you should read what can happen to you if violate those terms of service. You would probably be sad if your entire account were shut down, for instance.) That makes sense. A legitimate review comes from somebody who is not incentivized to leave it because they can collect cash if they do. This is not to say that you should not ask for online reviews. You should! But we would never recommend that you offer a reward for doing so. Even if the review is genuine, it becomes tainted, to our mind, by the offer of a reward. Furthermore, any company interested in holding a raffle should also review with their attorney what the rules are in their state or municipality when it comes to holding raffles. There usually are rules, and it can potentially be criminal to violate those rules. This is not legal advice. Rather, this is advice to go get legal advice if you are thinking about holding a raffle. The bottom line here is that online reviews are important (why else would this organization be seeking them?). It’s a good idea to ask your customers for reviews. It’s a good idea to ask them in person and off-line. But, you have to be careful how you ask! (Here are some tips on how to go about obtaining online reviews.) And don’t buy fake online reviews, either! Do you need help monitoring and/or responding to online reviews? Our rates are very affordable. Contact us today about helping you to stay on top of what people are saying about you online. Do you agree or disagree? What other problems, if any, do you see with this attempt to obtain favorable online reviews? What have been the most egregious requests for reviews that you have seen? Let us know in the comments below.